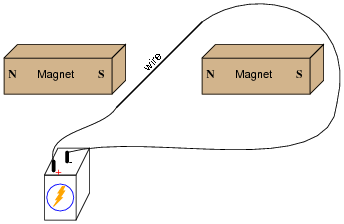 If the ends of a wire loop are attached to two half-circular metal strips, arranged so that the two strips almost form a complete circle, and those strips are contacted by two "brushes" which connect to opposite poles of a battery, what polarity of voltage will be measured as the loop is rotated counter-clockwise? Follow-up question: does the polarity measured at the two carbon brushes ever reverse? Or, to phrase the question another way, if a resistor were connected between the two brush contacts, would it ßee" direct current (DC) or alternating current (AC)? Explain your answer. Ask your students what the two half-circle metal strips are called, in electric motor/generator terminology. How does Faraday's Law of electromagnetic induction relate to the voltage output of a DC generator? According to Faraday's Law, what factors can we alter to increase the voltage output by a DC generator? Increase the [(df)/dt] rate of change, or increase the number of turns in the armature winding. When the generator is spun fast enough, it generates enough voltage to energize the shunt coil with enough current to close the relay contact. This connects the generator with the battery, and charging current flows through the series coil, creating even more magnetic attraction to hold the relay contact closed. 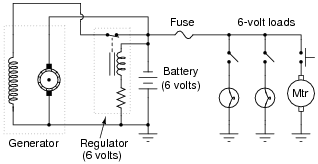 If the battery reaches a full charge and does not draw any more charging current from the generator, the relay will still remain closed because the shunt coil is still energized. However, the relay contact will open if the generator ever begins to act as a load to the battery, drawing any current from it. Explain why this happens. 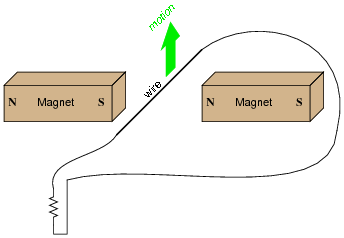 If a reverse current goes through the series coil, the magnetic field produced will "buck" the magnetic field produced by the shunt coil, thus weakening the total magnetic field strength pulling at the armature of the relay. A "reverse current cutout" relay ingeniously exploits reversible magnetic polarities to close or open a contact under the proper conditions. 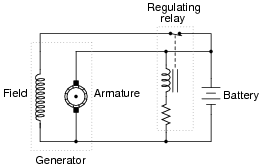 Although DC generators are no longer used in the majority of automobile electrical systems (AC alternators using bridge rectifiers to convert AC to DC are used instead, with the rectifier circuit naturally preventing reverse current), this application provides an excellent opportunity to explore an application of relay technology in the context of generator control. Like all electromagnets, the magnetic field strength produced is in direct proportion to the amount of current through the wire coil. But when the generator is sitting still, its output voltage is zero, and therefore there will be no current through the field winding to energize it and produce a magnetic field for the armature to rotate through. This causes a problem, since the armature will not have any voltage induced in its windings until it is rotating and it has a stationary magnetic field from the field winding to rotate through. It seems like we have a catch-22 situation here: the generator cannot output a voltage until its field winding is energized, but its field winding will not be energized until the generator (armature) outputs some voltage. How can this generator ever begin to output voltage, given this predicament? Usually, there is enough residual magnetism left in the field poles to initiate some generator action when turned. Challenge question: what we could do if the generator's field poles ever totally lost their residual magnetism? How could the generator ever be started? Back in the days when generators were common in automotive electrical systems, this used to be a fairly common problem. However, generators could be "flashed" so as to re-establish this residual magnetic field once again. In a shunt-wound DC generator, the output voltage is determined by the rotational speed of the armature and the density of the stationary magnetic field flux. For a given armature speed, what prevents the output voltage from "running away" to infinite levels, since the output voltage energizes the field winding, which leads to greater field flux, which leads to greater output voltage, which leads to greater field flux, which leads to . . . ? Obviously, there must be some inherent limit to this otherwise vicious cycle. Otherwise, the output voltage of a shunt-wound DC generator would be completely unstable. At a certain amount of field winding current, the generator's field poles saturate, preventing further increases in magnetic flux. 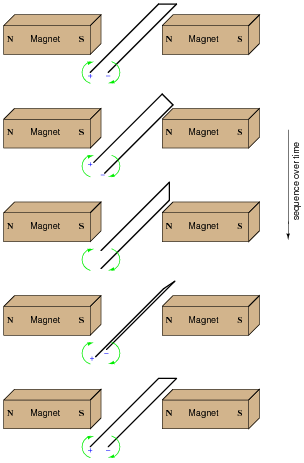 This question provides a great opportunity to review the concept of magnetic ßaturation," as well as introduce the engineering concept of positive feedback. 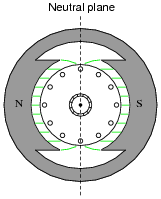 With regard to a DC electric generator, what is the neutral plane? Why is this important? Ask your students why the "neutral plane" is an important aspect of a DC generator or motor's geometry. What relation does the neutral plane have with regard to brush positioning? At what point in the armature's rotation do we want to have the brushes break contact with one commutator bar and make contact with another: when the coil primary to that commutator segment is outputting maximum voltage, or minimum voltage? Suppose a generator is mechanically coupled to an internal combustion engine in an automobile, for the purpose of charging the starting battery. In order that the battery not be over-charged by the generator, there must be some way of controlling the generator's output voltage over a wide range of engine speeds. How is this regulation of generator output voltage typically achieved? What variable within the generator may be most easily adjusted to maintain a nearly constant output voltage? Express your answer in relation to Faraday's Law of electromagnetic induction. The most common method of generator voltage control is adjustment of field winding excitation. Although adjustable field winding excitation is the most popular form of generator output voltage control, it is not the only means. Challenge your students with inventing other means of charge control for the battery in this automotive electrical system, besides field winding excitation control. What else can we do to the generator, or to the circuit it is within, to achieve charge control for the battery? In most high-power DC generator and motor designs, the wire used to make the field winding is much thinner gauge than the wire used to make the armature winding. This indicates the relative magnitude of current through these respective windings, with the armature coils conducting much more current than the field coils. 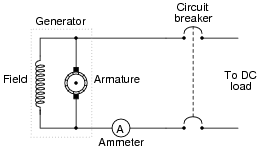 That the armature conducts more current than the field is no small matter, because all current through the armature must be conducted through the brushes and commutator bars. The more current these components have to carry, the shorter their life, all other factors being equal. Couldn't the generator be re-designed so that the field conducted most of the current, with the armature only conducting a small amount? This way, the brushes and commutator bars would only have to carry a fraction of their normal current, making them less expensive and longer-lived. Explain why this is impossible to do. Hint: consider the design of a permanent-magnet generator. It is impossible for the field winding to conduct more current than the armature in a functioning DC generator, because the armature has to be the source of electrical power, while the field is only a load. Being that brush and commutator wear is the main reason AC motors and generators are favored over DC, any idea that may potentially reduce the "wear and tear" on DC motor or generator brushes is worth considering. However, the idea proposed in this question will never work. This is not necessarily an easy question to answer, as it tests the students' comprehension of generator theory. 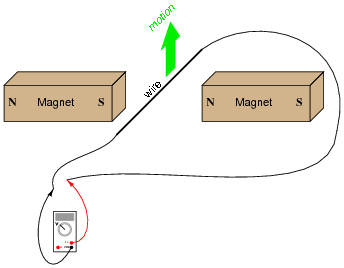 The hint given in the question ("consider a permanent-magnet generator") is intended to force students to simplify the problem, by considering a working generator design that only has one winding (the armature). By simplifying the problem in this way, students should see that the armature winding has to carry the bulk of the current in a DC generator.